Welcome to the Honolulu Museum of Art’s online version of the exhibition Allure: Elegant Women in Japanese Prints! Please use the categories to the right to navigate through the exhibition. Mobile devices begin here. Beauty. Perhaps no word is more intimately associated with art, and yet more elusive to define. Few concepts are as subject to change as that of beauty; different societies imagine it in radically different ways, and even within a single social group, standards can vary dramatically over time. Are blackened teeth beautiful? Shaved eyebrows? Hairstyles in which the coiffure curves out to each side like a paper lantern? Does beauty come from the particulars of one’s body or face, from the way in which one dresses, or is it a quality of one’s character, manifested in certain modes of behavior and social refinements? Beauty (bi ) was of fundamental importance for Japanese artists during the Edo period, and one of the main genres was “pictures of beauties” (bijinga). No tradition better embodies the challenges involved in trying to understand the significance of beauty than that of the “art of the floating world” (ukiyo-e), which emerged from the distinctive popular culture of early modern Japan. In particular, commercial woodblock prints, the mainstay of ukiyo-e throughout the Edo period, were as ephemeral as the very idea of beauty from which they drew their primary inspiration. The perception of beauty in ukiyo-e at times seems superficial; countless women are shown in similar poses, distinguished only by details of fashion that varied, as they do today, from year to year. Yet, through the eyes of a master artist, beauty could offer insights into the human condition of surprising depth; Harunobu’s sensitive juxtapositions of fragile beauties with the changing seasons lead to meditations on the impermanence of not only youth, but indeed time itself, while Utamaro’s portrayals of sisters, mothers and children find beauty as much in their tender relationships as in their outward appearances (which nevertheless are as exquisitely rendered as any artist in the history of ukiyo-e). This exhibition includes many of the finest designs by the leading artists from the full flowering of ukiyo-e during the 18th century, selected from the Honolulu Museum of Arts’ collection of more than 11,000 woodblock prints, one of the largest in the world. This was a time in which bijinga reached its zenith, characterizing the way in which the world would come to understand the Japanese conception of beauty. 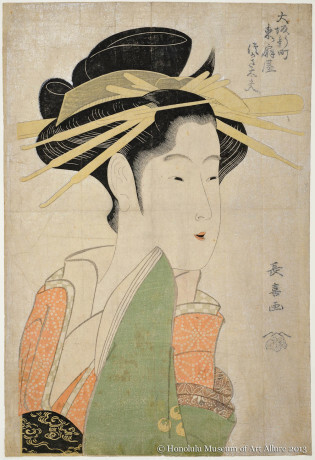 The exhibition Allure: Elegant Women in Japanese Prints is on display at the Honolulu Museum of Art from March 21 to May 5, 2013. Please visit the museum during this time to see the artworks in person! The entire staff of the Honolulu Museum of Art would like to express its deep gratitude to the Robert F. Lange Foundation, which continues to support the Asian Art Department's efforts to catalogue and conserve its collection of Japanese woodblock prints, including the artworks in this exhibition.